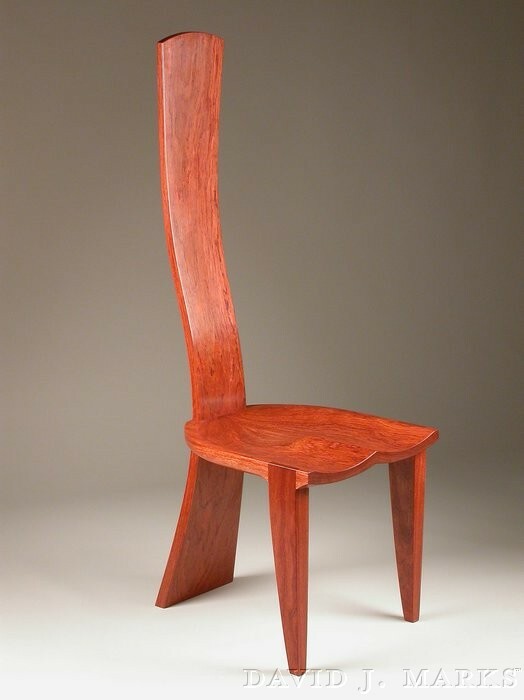 Recently a client who purchased WoodWorks Season 5 DVD and is working on building the Contemporary Dining Chair (episode 507) emailed David about his recommendations for a vacuum press. This project involves bentwood lamination for the curved chair back. The vacuum press is necessary for the glue up of the numerous laminates. What vacuum press make/model does David recommend I should purchase? As you might know, I have built my own vacuum press by purchasing a 3/4 horsepower oil-less pump from Graingers back in 1989, and making my own bags from rolls of 16 mil and 20 mil vinyl as well as my own platens of various sizes from 3/4 inch thick Ultralight MDF. I used to like to make my own bags and occasionally still do, so that they can accommodate various sized projects. The problem I have had over the years is getting small leaks in the bags which I have had to patch with vinyl and vinyl cement. For other woodworkers that are getting started in vacuum pressing, I have recommended the Vacu Press Company in Maine. I have worked with the Vacu Press systems at other schools and they are really solid and reliable systems. Check out their website and review what they have to offer to see how they match up with your needs. I have used their vinyl bags with great success and in recent years I have gone to the polyurethane bags because they are much stronger and don’t seem to get leaks like the vinyl bags can do over time. Some woodworkers have used “Joe Woodworker.com” to build their own vacuum presses and they seem to be happy with the results as well as the price, so you could check them out as well. Keep in mind that I purchased an oversized motor (3/4 horsepower ) vacuum pump back in 1989 because I needed to glue up large panels for a floor that I was making and evacuate the air quickly. Most vacuum pumps have 1/3 horsepower motors which are quite sufficient. My work expresses a sense of time and mystery. My inspiration is derived from a fusion of styles including ancient Egyptian, African, Art Nouveau, Art Deco and Asian. But essential to all my designs is the attention I pay to fine details. After studying art at Cabrillo College in Santa Cruz, I moved to Santa Rosa and began working in cabinet and furniture shops during the 1970s. In 1981, I opened my own Santa Rosa studio and built one-of-a-kind furniture throughout the 1980s. In the 90s, my focus shifted towards wood turning and sculpture.